I have always been in decent shape. I've never been a great athlete, but I've always been relatively strong, have had good stamina, and worked hard to stay flexible. And I've always enjoyed moving, whether walking, playing tennis, swimming, or dancing. But the last few years have really taken their toll. I was rear-ended at a low speed, which really fired up my existing neck problems. Then I totaled a car. Then I was hit in the lower back by a motorized grocery cart. (!!!) Then I was in another car when it was totaled and cracked a rib. Then I had carpal tunnel surgery and a couple of falls. So I have had several year s of low activity. The fact that all of this happened as I moved toward and past fifty probably didn't help. I have lost a lot of fitness ground the past few years, and I've decided that I need to start getting some of it back. Because I already have arthritis and quite a bit of chronic pain from an old neck injury and my ankle reconstruction, anything too vigorous is out, but I've been walking daily, spending quite a bit of time in my pool, and now after a couple of massages to help out with some of the worst pain and stiffness, I am getting ready to start a yoga class. I don't want to be weak. Or stiff. I will definitely be in pain, no matter what I do, so I'd rather be hurting while I'm moving, instead of sitting still. So. I lost my step-dad last Friday. People who don't know me or our family well assume that means that my mom's husband, who was not my father, died and that while I'm sad, it's not--as someone said to me--my father that died. No. It's not. It's far, far worse. I know this, because 11 years ago my father, the man who was biologically responsible for my life, and with whom we lived for the first 16 years of that life, did die. And it was hard. It was hard for me to have to give up months of my life caring for someone who had hurt me--and my precious mother-- badly, repeatedly. It was hard for me to care about his eternal well-being, and the fact that that was was hard hurt me, too. But, I wasn't sad that he was gone. I was, to tell the truth, relieved. He could do nothing else to hurt me. He couldn't hurt my children, my brother, my nieces, or my cousins. But this. This is a searing pain. 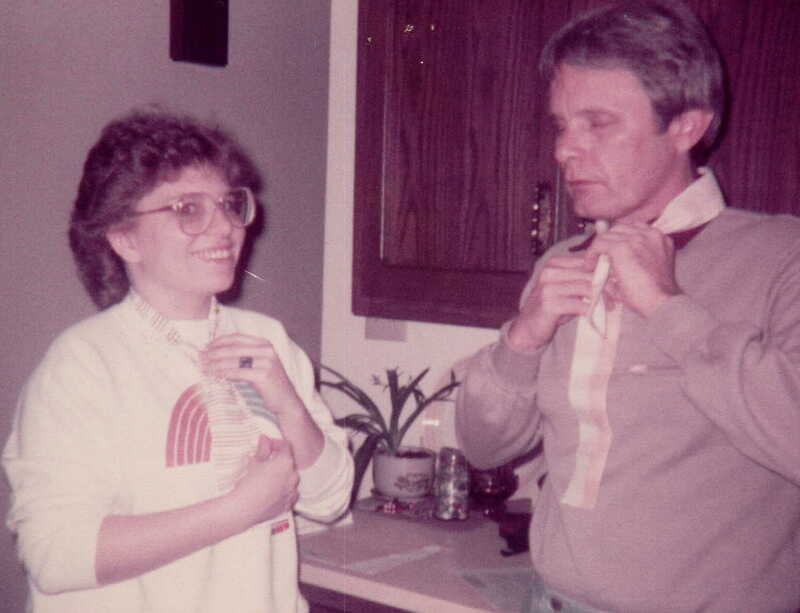 John Ronald Harris came into our lives sometime around my 18th birthday, give or take a few months. He was good to my mother and made her happy. He was nice to me and to my friends. As the months, and then years went by he became part of the fabric of our lives. He gave advice, whether I wanted it or not. He teased, but without the cruelty that I was used to. There was no struggle for me to accept him in our lives. He had that relatively easy, because we all were love-starved. It took me longer to really trust him, but that did come after a few years. As I struggled through my early college years, he was there, supportive for my mother and I both, and treating me as though I was his child, even--when I was having problems--upset about someone messing with "one of his kids." That was over 28 years ago. In those 28 years, he paid for the college education that my father was supposed to have helped with. He watched my three year old daughter when she had the chicken pox, so that I wouldn't miss class. He put up with having the kids and me in his house for weeks at a time during various moves. He gave advice, whether I wanted it or not. And we all grew to love him. Tremendously. He was generous. One of the most generous people I have ever known. We enjoyed wonderful vacations with my step-siblings that we could never have afforded if he hadn't helped to offset everyone's costs. He gave low interest loans for home down-payments. He was always helping someone out. Many years ago, he and my mom requested that in lieu of Christmas gifts for them we make charitable donations. That is how he was. And with him we got a, big wonderful family. I got to know his mother well enough that I mourned her passing. 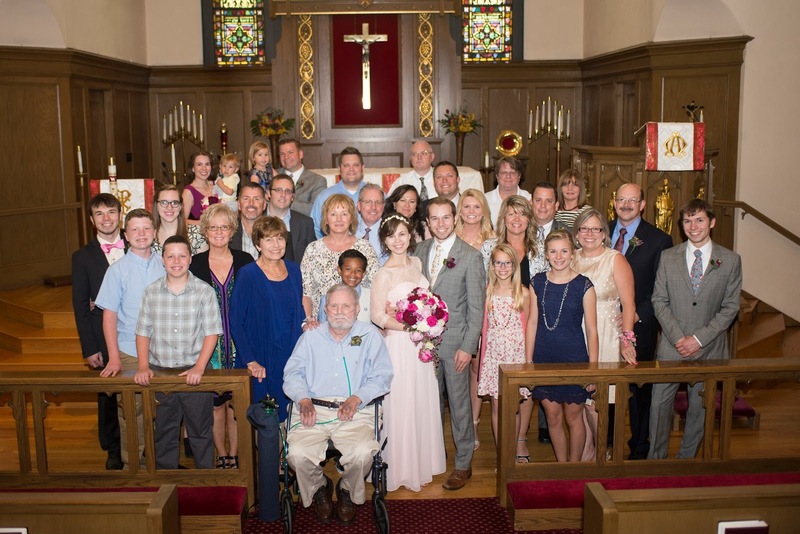 I got older brothers and two sisters, and over the years they have brought a richness of in-laws and nephews. We got Godsons and all kinds of other interesting family connections. Most of all, we got a whole bunch of people to love. 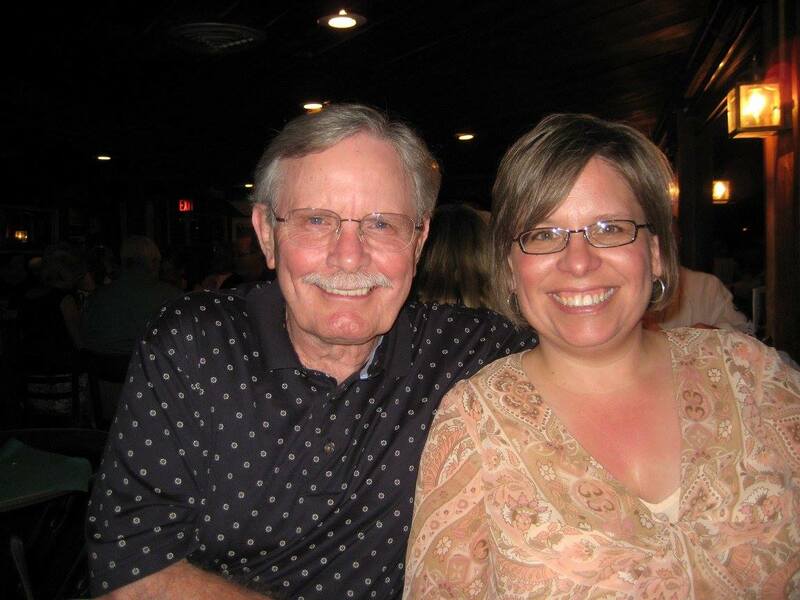 Brad, Susan, Curt and Brenda shared their father with us unstintingly, and for that I am forever grateful. 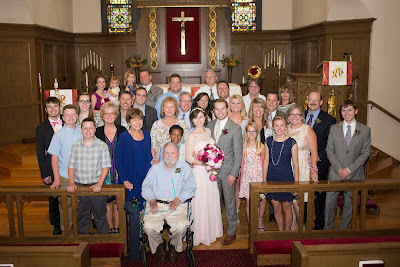 Most of the family at Patrick & Emma's wedding, May 30, 2015. To my children, he was "Grandpa Ron" when they were little, changing to "Grandfather Dear" as they got older. It was an incredibly special relationship, and he always treated my children and my brother's girls exactly the same as he did his grandchildren-by-blood. 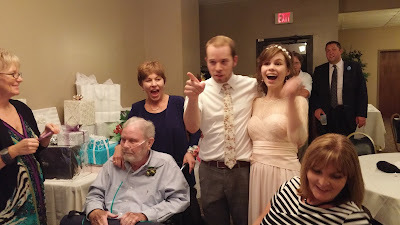 One of the wonderful gifts God has given us in these last months was to have Wicked (explanation here) present at two of my sons' weddings in May. Over the last several years he showed us all a wonderful example of courage and faith. As his body got weaker, he kept fighting, and kept living. Instead of getting crabby and bitter, as people so often do when they are wracked with pain and know that death is nearing, he got sweeter and more concerned about all of us. He was sure in his faith, and knew his eternal destination, as did all of us. I will miss his presence. His bad jokes. The hard time he gave me when I would call on the phone. His many, many emails. And all of the advice, whether I wanted it or not. I am thankful for the memories. I am thankful for all that he did for my mom, my brother, and for me. I am thankful that my kids had such an awesome grandpa, and that my husband had a father-in-law he could love and respect. I am thankful that he leaves our whole big, wonderful family with so many memories to cherish, that will bring much laughter--and some tears--in the years to come. Hope is what remains to be seen. So, last month this happened. 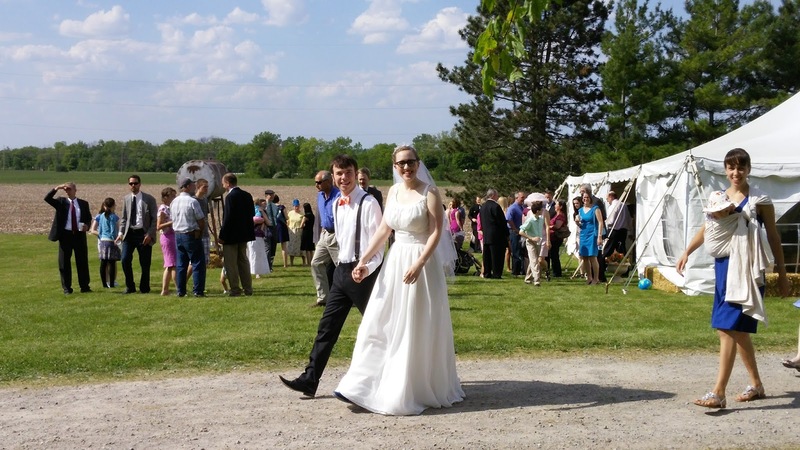 Those are my first and second sons, with their brides. In the space of less than a month we went from a household of five on the weekends and four during the week (with a friend of the family often upping that to five) to a household of three on the weekends and two during the week. Just four years ago we were a full-time family of six. I am discovering some unexpected consequences. Even after I cut up five or six of the rattiest towels, all of my bath towels do not fit on their shelf in the linen closet. Fewer people equals fewer showers equals fewer towels hanging or in the laundry at any given time. We don't have room for all of the glasses in the cupboard when they're all clean. See towels, above. I was a mother of four-at-home--and my husband was mostly around--for over 15 years. I have lived with my three teen and young adult sons during the weeks, adding my husband on the weekends, for the last four years. I don't know how to cook for two or three people. I don't know how to manage a small household. The last time we were a household of three was almost 25 years ago.